Diamondbacks first baseman Paul Goldschmidt and Astros second baseman Jose Altuve continue to lead the pack in the National and American League, respectively. With the season entering its final quarter, the MVP races in both leagues are wide open, and injuries both past and present could have a significant impact on the outcomes. Whereas last week’s Awards Watch, written by my SI.com colleague Gabriel Baumgaertner, looked at all three major player awards in each league, this time around we'll take a deeper dive into just the MVP scrum. The 29-year-old two-time runner-up in the NL MVP voting (2013 and '15) is a strong candidate on many fronts. His power numbers shown above—which are good enough to rank fourth in home runs, fifth in slugging percentage and second in RBIs in the NL—aren't off the charts, but they are certainly good enough to satisfy the more traditional-minded voters. He's also shown off his offensive versatility, given that he's third in walks (79), second in on-base percentage and 16-for-20 showing in stolen base attempts. From an advanced statistical standpoint, his numbers hold up after adjusting for Arizona's hitter-friendly ballpark (his 158 OPS+ ranks fifth in the league), and he's elite with the glove, too (+10 Defensive Runs Saved), boosting him into the NL lead in position player WAR (Baseball-Reference.com version). Add to that the narrative flourish of timing one of his best seasons with the Diamondbacks' rebound from league-wide laughingstocks to wild card contenders and it's not tough to see why he's the favorite here. A ridiculous home run binge that included dingers in six straight games, 11 in a 12-game span, 23 in a 35-game span has not only lifted Stanton to the league lead, the franchise record and a career high, it's also pushed him into the MVP picture. The 27-year-old masher leads the NL in slugging percentage and ranks fourth in position player WAR. The real problem for him with voters will be that the Marlins (58-61) aren't contenders, where the other top candidates hail from teams still in the hunt. Although it remains to be seen how long Nationals outfielder Bryce Harper will be out of action after a terrifying but thankfully not catastrophic hyperextension of his left knee last week, his injury has opened the door for other MVP candidates to get more consideration. Scherzer, whose path to a second straight NL Cy Young Award has been cleared by Clayton Kershaw's lower back strain, is the immediate beneficiary in these rankings. His 6.6 WAR (which includes 0.6 as a hitter, based on a .208/.269/.271 line with 10 hits, including a home run), is the best in the majors. Still, it's worth noting that the last two pitchers to win MVP awards, the Tigers' Justin Verlander in 2011 and the Dodgers' Kerhsaw in '14, had 24 and 21 wins, respectively. With a likely maximum of 10 starts remaining, it's unlikely Scherzer will have a similarly gaudy total to sway traditionalists who are disinclined to give a pitcher their MVP vote. Not surprisingly, Arenado has been far better at Coors Field, where he's hitting .339/.376/.665 with 15 homers and 64 RBIs, compared to .285/.347/.519 with 12 homers and 39 RBIs—in six more games—on the road. Still, he's a threat to win his third straight NL RBI crown, although his third consecutive home run title is less likely (he's 10th this year). His altitude-adjusted 128 OPS+ is good but unremarkable; his selling point besides the gaudy traditional stats is his elite defense (+18 DRS) that has him running third in position player WAR. The fact that the Rockies look headed for the postseason as a wild-card team doesn't hurt. The raking redhead has sizzled with the stick all year; he leads the NL batting race and he is second in on-base percentage and fourth in OPS+ (161). With six homers in an eight-game span from Aug. 5 to '13, Turner's power certainly shouldn't be taken for granted, and with above-average defense (+4 DRS), he's seventh in position player WAR despite a three-week DL stint in the spring for a hamstring injury. Therein lies one knock against him, however; because of that absence, his counting stats don't jump off the page, and with teammates Corey Seager (5.0 WAR, 139 OPS+, 19 HR) and runaway NL Rookie of the Year favorite Cody Bellinger (4.0 WAR, 150 OPS+, 34 HR) providing similarly impressive firepower for Los Angeles, it's tougher to make the case that Turner is THE GUY for the Dodgers. 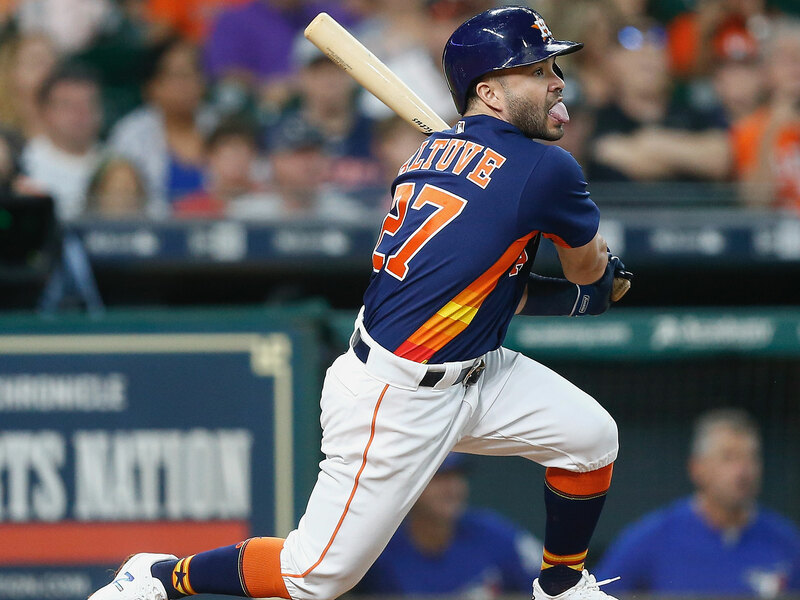 Altuve entered the year as a two-time batting champion with three straight seasons of 200 hits under his belt, and all he's done is produce a career year. Not only is he running away with another batting title—he leads runner-up Jean Segura of the Mariners by 44 points—he also leads the AL in OPS+ (173), total bases (262) and WAR. The best player on the league's best team would appear to be a lock, but if the team continues to slump (Houston is 6-11 in its past 17 games, entering Thursday) as its players pout about the club's minimal moves at the trade deadline, that could turn off some voters and shift the focus elsewhere. The reigning AL MVP has hit .343/.473/.581 since returning from a six week absence due to a torn ligament in his left thumb, and for the season the just-turned-26-year-old is setting career bests in all three slash stats as well as OPS+ (207, but still 38 plate appearances short of qualifying for the league lead). That time off is the biggest reason he's tied for fourth in the AL in WAR (5.1, same as Boston's Mookie Betts), instead of a lock for his sixth straight league lead in that category. More importantly, a threadbare Angels squad that has just one other regular with an OPS+ above 100—shortstop Andrelton Simmons, whom you can read more about below—and 19 starts worth of contributions from currently active pitchers with an ERA+ above 100 has somehow gone 17-12 since Trout’s return. If he pulls off the miracle of helping Los Angeles to a wild card berth, he'll for once have the narrative aspect in his favor, creating a pathway to his third MVP award. Voters looking for a candidate from the AL East-leading Red Sox might be tempted to consider Betts, who has played elite defense (+28 DRS) but isn't producing near the same offense he did last year (107 OPS+, compared to 133 in 2016). That should help shift attention to Sale, who leads all the Pitching Triple Crown categories as well as FIP (currently the AL's lowest since Pedro Martinez in 1999) and WAR, and who has picked up the slack for the absent David Price and the sluggish Rick Porcello. When he hits 'em, they still go a long, long ways, but Judge—who leads the AL in homers, slugging percentage, runs (91) and walks (88)—hasn't fully arrested his second-half slide. He's hitting just .185/.346/.398 since the All-Star break and .204/.361/.429 with a 39% strikeout rate in August, which wouldn't stand out so much if the Yankees' offense weren't sputtering (they've scored 3.67 runs per game while going 7-8). His season is still a remarkable one, and he'll deserve that AL Rookie of the Year award, but unless he powers his team closer to the top of the AL East, he'll face an uphill battle for this hardware. Simmons, who turns 28 on Sept. 4, is a longshot, but his career year has moved him into the discussion. The owner of a .261/.308/.363 lifetime line through 2016—that’s an 86 OPS+—has put up a 116 mark this year while providing typically stellar defense (+23 DRS). He hit .303/.346/.500 during Trout’s 39-game absence, helping the Halos stay afloat, and he’s currently second among AL position players in WAR. His more famous teammate is probably an impediment to his cause, but if this level of offense is for real, Simmons could wind up in these discussions annually.